Tool Fab’s thread mills are the best quality in the industry. Our thread mills are cam-ground for durability and ease of re-grinding for long life and low cost thread production. 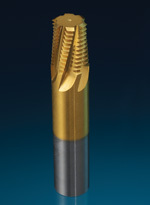 Tool Fab’s Schmarje thread mills are cam-ground for maximum thread, cutting strength, durability and ease of re-grinding. We will gladly re-grind our tools for a minimal charge and maximum life cycle of the thread mill.